I will post art soon , but first things first...FRIDAY FEBRUARY 6th- CORALINE OPENS IN THEATERS EVERYWHERE! , and Myself , would be responsible for the FINAL CHARACTER DESIGN in the film. showing a lot of the art department's work along with Puppets and Sets. So that's rad. 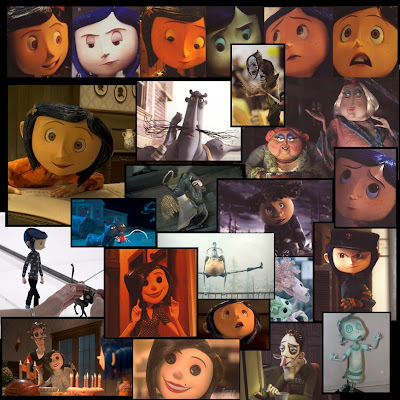 Bottom line: Coraline is an incredible achievement on so many levels. This is the kind of film most people (especially in animation) say they want to see more of (or at least work on)- A more adult, edgier, unconventional animated film. Coraline follows no convention. Henry has created a new fairy tale film language. We need films like this to succeed, because I for one want to work on more like them, and so studios like LAIKA can CONTINUE TO TAKE RISKS. So please people! GO SEE CORALINE FEBRUARY 6th !!!! !